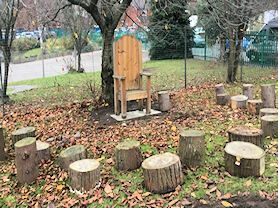 Mr Milligan has been working very hard developing and creating the EYFS outdoor environment. Mr Milligan is delighted to have Year 5 helping him in this endeavour. The photo shows our new outdoor reading area! Members of our winning debating team. 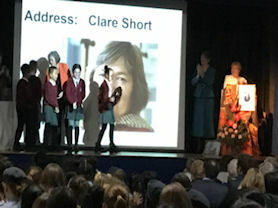 Our Year 5 debating team won the Caritas Christi Debating Competition, and were honoured and extremely proud to receive their award shield for a second time at St Paul’s School for Girls Awards Evening. The Debating Shield was presented to them by former Labour MP and Cabinet member, Clare Short - herself a St Paul’s old girl! One of our Upper KS2 children won the 2018 Abraham Wilson No Fear Award out of hundreds of children throughout Birmingham who took part in Jazz Elective sessions with Services for Education Music Service and Town Hall/Symphony Hall. She consistently demonstrated enthusiasm, commitment and musicianship and continues to do so. 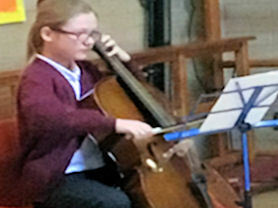 As part of her prize she was awarded a cello (which she is playing) and a year of free tuition! 100 years ago the guns fell silent on the world’s first global war. During a whole school assembly on Friday 9th November led by Mr Paine we remembered all those who lived through this tragic time. 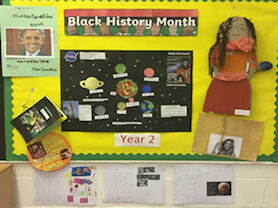 Some of our work for Black History Month. Throughout the month of October we set the children in Years 1 to 6 a special challenge to choose and research a black role model from the past or present day and find out as much information as possible thinking about key questions. We have been overwhelmed by the high standard and creativity of this challenge and feel that an assembly will not do justice to the work of the children. 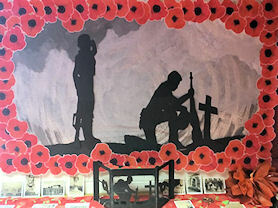 So instead of an assembly, the children’s work was displayed in a Black History Exhibition from Thursday 8th November until the end of November on Tuesdays and Thursdays. 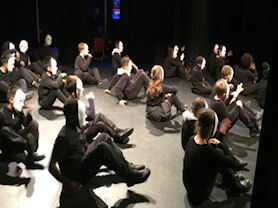 Year 5 at The Old Rep.
Year 5 performed the excellent play ‘Macbeth’ at the Old Rep Theatre in Birmingham. They rehearsed for the play for six weeks and even memorised lines at home to make sure that they would put an incredible show on for the audience. There were four hundred people in the audience, some Year 5 were a little nervous but glad to have the opportunity. After the play finished the stage echoed and rumbled with the audience cheering and clapping extremely loudly! Children enjoying one of their runs. 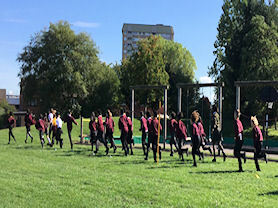 The Daily Mile supports our children’s fitness, stamina, health and mood. Recent research shows daily physical activity has a positive impact on children's behaviour and concentration levels. It is a simple yet effective, enabling every child in our school to be active. 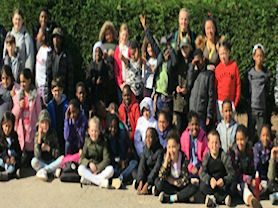 Mrs Dickinson and a group of children from Year 4 joined over 60 children from thirteen different primary schools and two secondary schools on a fun filled, action packed three night weekend residential trip to Kingswood in Staffordshire. Our children overcame a number of fears, supported others, tried many challenging activities and made new friends. It was a truly awe inspiring and amazing experience for both adults and children. We can’t wait for next year! 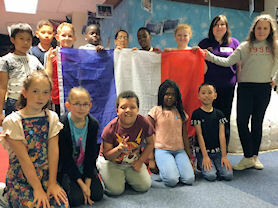 French lessons in Year 4. Angela Livingstone from Frenchtatsic came into school and worked with Year 4. We are delighted to welcome Angela to the Oratory family. She will work with our children on a Monday afternoon and also begin a French Club after school in the new academic year. She said, "It was a real pleasure to meet you all, thank you for such a warm welcome. It was wonderful to see the children enjoying themselves so enthusiastically! I am really looking forward to working with the Oratory in September." 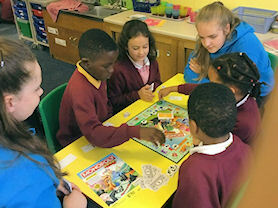 St Paul's pupils working with Year 2. Guardian Angels from St Paul’s School for Girls came to work with Year 2 on money matters! They told stories about the importance of thinking about money and how important it is to save and look after money in a sensible way. he children then had a game of Money Monopoly. Six games were donated to the school. Thank you St Paul's! 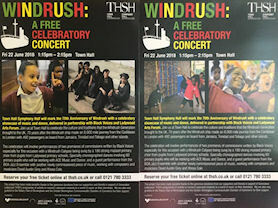 Year 4 were involved in a spectacular concert at Town Hall Symphony Hall to mark 70 years since the Windrush ship made an 8,000 mile journey from the Caribbean to London with 492 passengers on board from Jamaica, Trinidad, Tobago and other islands. It was a celebratory showcase of music and dance, delivered in partnership with Black Voices and Ladywood Arts Forum. Some of our competition entries. 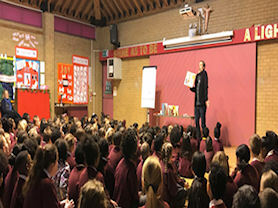 Our children were set the task over the Easter holidays to create, write and illustrate their own picture book in the style of David Lucas following his visit to the school in March. 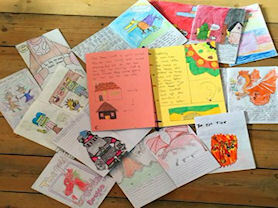 He tweeted, "Some of the wonderful picture books made by children after my workshops at Oratory School." So many different skills have to combine in a picture book: good use of language, storytelling, character creation, drawing, page-design, lettering, book-making. David Lucas announced the winners: first prize goes to Ester Manukyan in Year 4 followed closely by Maya Bhatoa and Tyla Davis in Year 5. David Lucas speaking to the children. Our children took part in a ‘Create a picture book’ workshop led by David Lucas. The workshop was highly structured, with a clear, tangible goal. The tension between formal structure and free-wheeling imagination sparked lots of creative energy! In the workshop David demonstrated how he draws – then everyone drew together – each child making their own picture of one of his characters. David then wrote lists of mixed-up ‘picture words’ that the children choose from, to each create an exciting, original character of their own. The children discussed story ‘problems’. At the end of the workshop David explained how to turn their story into an illustrated book of their own, with front and back covers, reviews, blurb, and a decorative title page with dedication and copyright info – so their book will feel as much as possible like the real thing. Commenting on his visit David Lucas exclaimed, "Thanks for a lovely day at the Oratory - I was inspired by the children’s character and story ideas. I’m looking forward to seeing their finished books!" All dressed up on World Book Day. 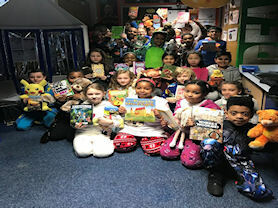 On World Book Day our children dressed in their pyjamas and shared their favourite bedtime read! Everyone entered into the fun and enjoyed sharing their favourite book with one another. Over £145 was raised for Diabetes UK.